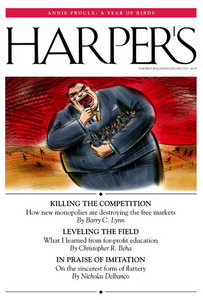 An essay in the February issue of Harperâ€™s Magazine, â€œKilling the Competition: How the newÂ monopolies are destroying open markets,â€ by Barry C. Lynn, includes Amazon in a growing list of American corporations that are pushing â€œmonopolization of our private markets.â€ Included are Apple, Google, Intel, and Pixar (which together colluded to prevent employees from getting jobs at other firms), the Brazilian food giant JPS (which sets chicken prices throughout the South), the advertising giant WPP (one of four large advertising holding companies), and Anheuser-Busch InBev and MillerCoors (which together control 90 percent of domestic beer distribution). Lynn writes that many in the book business fear Amazon in the same way as â€œthe chicken farmers of the Sweedlin Valleyâ€ fear JPS. Harperâ€™s includes Amazon in its â€œnew networkâ€ of monopolies; major publishing CEO calls Amazonâ€™s CEO â€œdangerous” (via Melville House Books).